Jay Karen’s Video Blog and the following posts on the PAII Forum got my brain a racin’. Like Jay we at The B&B Team visit many Inns and are also a witness to the good, the great and the not so terrific. On the subject of hangers let me first reveal a story from my innkeeping days. We had a ‘Housekeeping Checklist’ that included two check points, one to check to see if all six wooden hangers were present and two, to bring all wire/plastic hangers left by the guests down to the laundry room. When I would do the daily guest room checks I would sometimes find an ‘evil’ wire hanger and recall a scene in the biographical film about Joan Crawford, ‘Mommy Dearest’. The scene reveals Joan, a compulsively clean housekeeper, finding a wire hanger in her daughter’s closet, she then commences to beat the daughter with the hanger while screaming, “NO WIRE HANGERS!” Now understand, I did not beat my housekeepers but would on occasion perform my best Joan Crawford imitation for my housekeepers, just for comic relief. Now we know that those wooden hangers do disappear on occasion but replacing them falls under the category of the cost of doing business, CODB. This term is generic for ‘expenses that covers all monetary expenditures necessary to operate your business on a day to day basis’. The fixed costs are your mortgage, utilities, insurance, wages, payroll taxes, etc. Any incidental materials you provide for your guests in the process of doing business in which you really can’t charge extra for have to be absorbed and covered by your profit margins. We all want to control our costs and price comparing online has become the best way to help keep costs down. I googled ‘wood hangers’ and the best price I found was from storesupply.com. 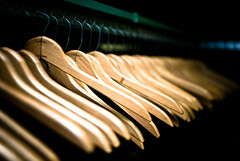 A case of 50 nicely finished wooden hangers cost $39. The cost per hanger comes to $.78. I am sure you could find a better price with a little more digging. We must always remind ourselves, it is all about the guest. The simple offering of a set of wooden hangers neatly placed in your closets shows you desire to provide for your guests a thoughtful guest room experience. Now as for the subject of laundry bags, I believe this offering is also very thoughtful. They are standard in hotels, why not B&B’s? A few innkeepers on the PAII Forum explained they did not want to use plastic bags because of the environmental impact. 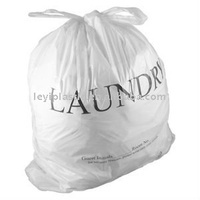 I found biodegradable plastic laundry bags on usfi greenworks. A drawback is the minimum purchase is 500 at $.49 per bag. This may present the opportunity to contact your neighbor B&B and share the cost. Sometimes the simple little offerings innkeepers provide turn out to be very big in the eyes of an appreciative guest. It is all about them. This entry was posted on Tuesday, September 27th, 2011 at 7:18 pm	and is filed under Innkeeping Business, Operations. You can follow any responses to this entry through the RSS 2.0 feed. Both comments and pings are currently closed.